Speaking to Bloomberg TV, former NY Fed president and Goldman managing director Bill Dudley brought brief tears of laughter to the eyes of traders when he said the biggest joke today, if not this year: namely that the Fed is not there to take away the market's pain. And then this: "It’s important that people in the markets should understand that the fed doesn’t care about market prices for themselves. They only care about market prices in terms of how it affects the economy, the unemployment rate and inflation." Why is this funny? Because taking away the market's pain is precisely what the Fed is meant to do... and Dudley knows it... and those watching Dudley know that he knows it. Hence the hilarity that ensues. ... which is notable because it again means that the Fed is focusing on the economy, and not the market, a welcome departure from the Feds of Greenspan, Bernanke and Yellen where the sanctity of the S&P was the supreme goal of all monetary policy. "[The Fed's] view is, the economy is growing at an above-trend pace. We already have a very tight labor market. We need to slow the economy down, and so somewhat tighter financial conditions aren’t really a bad thing. 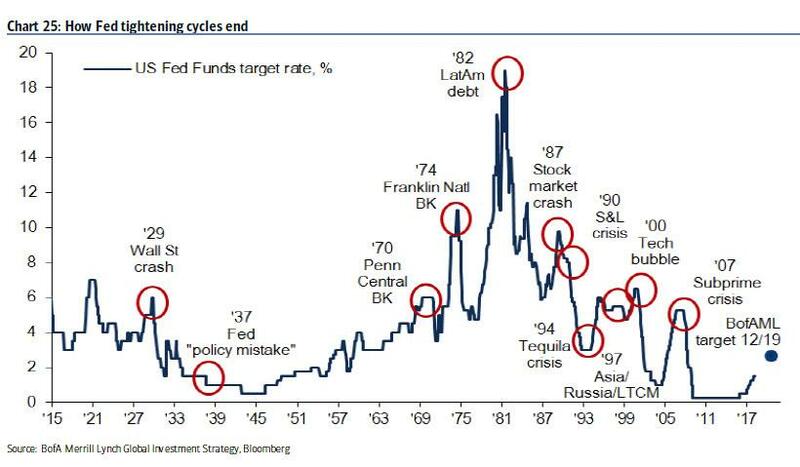 They’re probably a necessary thing for the Fed to achieve its objectives"
Time to trot out our favorite chart: the one which shows that every tightening cycle ends in a crisis, something which the Fed seems willing to risk this time as well. In kneejerk response, the Dow surged nearly 400 points when it tried hard to convince itself that Dudley was dovish, however after failing to do so, the Dow has since given back almost half the spike and was once again headed lower.